“The first rule of any technology used in a business is that automation applied to an efficient operation will magnify the efficiency. The second is that automation applied to an inefficient operation will magnify the inefficiency.” – Bill Gates. And so it is with Marketing Automation. Just as automation can free up your time for creativity, analysis, and decisions, automation also makes it easier to turn a small mistake into a large error. There’s no feeling quite like sending 100,000 people the same email twice. In 2 minutes. Oops. But mistakes like that pale in comparison to design decisions you make when managing your sales funnel. Automation firms sell you on how to make your job easier; to manage more leads with fewer people; and to prepare leads to be ready for the sales pitch. Precious little marketing automation content is focused on how your target audiences want to be treated. Let’s change that by exploring how the Golden Rule can help you build a better sales funnel. The Golden Rule says to treat others the way you would want to be treated in the same situation. How often have you seen poorly written email invitations to industry events? Or read critical blog posts about mail merge errors and automated “personal” emails? Or you receive a few too many reminders because some other marketer desperately needs you at their webinar? Is this how you want to be treated? So why are you doing this to your prospects and customers? In the past few years, content marketing has been re-born in a variety of channels because of the importance of SEO and offering relevant, valuable information about problems people care about. If you help people with their problems by teaching them about possible solutions, then they will start to trust and maybe even like you, both critical for a prospect to take the next step in working with your firm. Isn’t that how you work on creating solutions in your job or at home? If you treat your prospect list well, in the way you want to be treated on another firm’s list, your unsubscribe rate will be low. If you allow people to choose their method of communication, they will be more receptive to when you do contact them. If you offer your audience helpful content, rather than pushy or ham-handed invitations, they will help you with higher open rates or even sales. Marketing Automation tip: ask “Is this how I would want to be treated by a vendor?” If not, design a better workflow. Here are tips for building automated workflows which treat others the way you want to be treated in the same situation. Asking a Golden Rule Question at each stage of your campaign development or your lead management workflows will connect you to your customers in a more meaningful, human way. How do you keep a Golden Rule frame of mind? Ask Golden Rule Questions! There are plenty of opportunities to improve your workflows to save you time as well as make a good impression on people who contact your firm. One of the first things I did with Marketo was to build a series of workflows to route “bad” leads into buckets. These were groups of people we were almost certainly never going to speak directly to about a purchase. I could have left it at that, however, I believe that if someone contacts a company, they should receive some sort of response to help them. It would be great if we could respond to every student, professor, or random inquirer, but we can’t. So how do you solve this touch problem? Use Marketing Automation to Deliver on the Golden Rule! Your automation tool can also send an autoresponse with relevant details based on the inquirer’s title, product interest, landing page, and more. Make this message upbeat, directing leads to more self-help while also providing a phone number or response email address if they really need help sooner. Regardless of how you rank prospects, leads rank themselves Number 1. Make sure you acknowledge their interest in your firm. If you use a service level agreement with sales on contacts, be sure that is clear to the prospect. And be sure to fulfill that promise. If the prospect is using the free trial button and you screen trial activations, then be sure to tell people who do not qualify how else they can get help. I know shunting such people aside can put some people off, because an email can sound like “We’re too good to help you now, but try us a second time if you have money to spend.” I agree, that’s not a great way to handle people, which is why autoresponder copy has to be clear and helpful. Automation is so easy to misuse, allowing the computer to spit out discourteous, haughty messages with abandon. At the same time, automation can be everyone’s best friend, including your prospects’. If you have refined your scoring and qualification process, then your prospects won’t be annoyed by a sales person and your sales people won’t be annoyed by “not ready” leads. Allow tire kickers, students, and others to sign up for your newsletters, blogs, and other content. Keep their data close and see how they progress. Make special content for them and automate it. Let them know you care even if you both know there is little money coming out of that group. The worst thing you can do is ignore a lead because that only hurts your brand. If you dismiss and ignore inquiries from students or unqualified leads, they will remember in 10 years when they do need a solution you can offer. You can be sure your firm will be on the bottom of the RFP list. At each level of service you should leverage marketing automation to treat people the way you would want to be treated. When someone has no money to spend and needs something from your company, they know they are unlikely to receive help. How much better will they feel about your brand if they do get a tailored response! Perhaps creating a special program to nurture groups like Students or Professors will help prepare future buyers. Sign Up Pages: Leave opt-in boxes unchecked. Pre-checking opt-in is an old gimmick designed to take advantage of people, because we all know people don’t always pay attention. Later they realize they were had by your double negative phrasing and they will unsubscribe. Invitations: Please put in location links, maps, etc…the whole package in the landing page and all emails. I don’t want to be in suspense, I want to know if I can attend. Subscription Management: allow leads to self select the topics, frequency, and types of email whenever possible. Make it easy for people to change their mind with links on your site, privacy page, and emails. You will find treating people well helps you keep your active list longer and keep people more engaged too. Use the Golden Rule and you both gain. 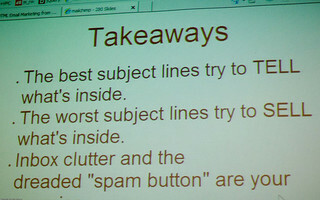 Clear Subject Lines: Write clearly in both the subject line and the body. Tell me why I should care. For webinars and events, please put the day and time in the subject lines. Avoid Deceptive Subject Lines: Loren McDonald at Silverpop points out several subject line gimmicks some marketers are using to increase Opens. As Loren points out, doing this ultimately lowers trust and reputation—and now that reputation is monitored, you are only doing yourself a disservice.